Herath causes Robson a couple of problems with the flight of his deliveries and the England player is forced to see out a maiden over. Prasad continues and Ballance mistimes a cut, almost chopping onto his stumps. The bowler then goes up for a big lbw shout but it appeared to pitch outside leg stump and a review is not called for, with replays showing an inside edge for good measure. A bouncer keeps Ballance on his toes before the left-hander flicks Prasad away through midwicket for a single. [lunch]Ballance works Herath through the on side for a single before the spinner sends down five dot balls to complete the morning session. England have kept the scoreboard ticking over for the loss of just Alastair Cook and although it has been slow going at times, the hosts now trail by just 151 with nine wickets in hand. The lunch interval is almost finished now and play will get back under way in about five minutes. Eranga is given the first over after lunch and concedes just one run from his six deliveries as Ballance cuts a short and wide one away to the man at deep point for a single. [umpire-review]Herath opens up after the break at the other end and has Ballance in all sorts of trouble second ball. 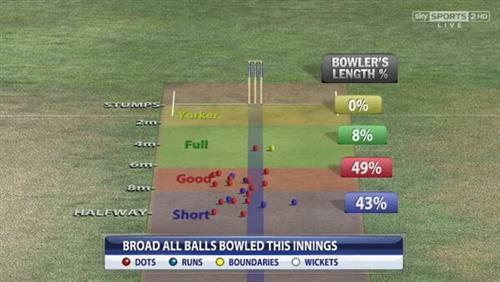 The left-hander misjudges one which pitched outside off, the ball spinning past his bat and into his pads. Ballance is given out lbw by Billy Bowden but decides to review and Hawk Eye shows the ball to be spinning down the leg side and the decision is overturned. 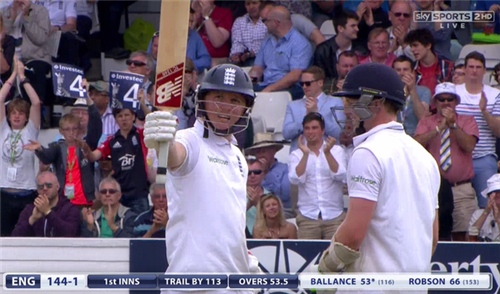 A huge reprieve for Ballance, who trades singles with Robson afterwards. There is then another close lbw shout to complete the over, Bowden giving it not out and it being umpire's call on the stumps. The review was not called for on that occasion, though. Eranga sends down a much less dramatic over, Robson cutting him away for a single and Ballance also running a single following a no-ball. Ballance runs a single off Herath before Robson leaves one which spins back in towards him and come perilously close to hitting his off stump. The right-hander gets back on the front foot next ball, tucking one away through midwicket for two runs. Eranga keeps it tidy and completes a maiden. 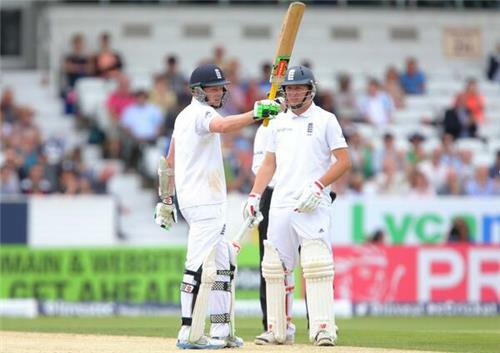 England are ticking over at a run rate of just over 2.5 an over so far in their first innings. Robson manages to get off strike despite Sri Lanka bringing their fielders in in the hopes of preventing the single. Ballance also manages to work a single off Herath before the end of the over. Ballance attempts to guide Eranga down to third man and, after a diving stop at gully proves ineffective, the ball trickles away to the boundary for four. Eranga is then pinged for a wide after a bouncer which strayed a little too high before Ballance and Robson both run singles and the former grabs two more to make it nine from the over. Robson cuts Herath away through backward point for two runs but that proves to be the only scoring from the left-hander's 13th over. Ballance flicks a single off his pads and Robson cuts away another solitary run as Eranga concedes two runs from the over. Herath sends down five dot balls before Robson ends the over by working him away for two runs into the on side. Big faith in the Twittersphere behind the two men at the crease. Who will make the most runs? Ballance or Robson & why? We'll RT some views. Nuwan Pradeep is brought back into the attack and endures a messy start, sending down a wide and a no-ball, with Ballance driving him through the covers for two in between. 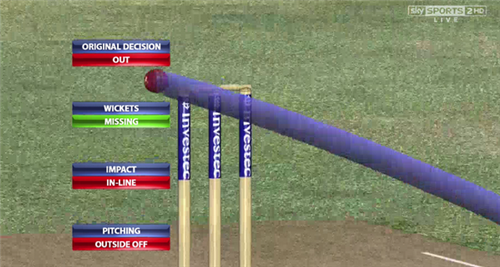 Things then pick up significantly as he beats Ballance all ends up with a beauty but just fails to find the edge. However, the left-hander then swipes two wide ones away square of the wicket for four, the second of which brings up his fifty. [andrewstrauss] He looks a very well-organised player and Ballance has made an impressive start to his Test career. Robson shows some more authority by coming down the wicket to Herath and lofting the ball straight back over his head for a one-bounce four. There are no runs from the rest of the over, though. The century partnership is brought up when Pradeep bowls a no-ball to start the over, which he quickly follows with another extra as he oversteps the mark again. The third no-ball of the over is signalled shortly afterwards and a fourth follows before the end, with Ballance this time complementing it with a run off the bat. Spinner Herath has no such problems with no-balls but he does concede a single when Ballance works him away to backward point. Pradeep bowls yet another no-ball, which Ballance sends through the covers for a single. It proves to be another expensive over as Robson flicks three runs through midwicket and Ballances gets two through the same area. Time for drinks. Robson gets a little restless after four dot balls from Herath and charges down the wicket, driving the spinner through the covers for a single, which proves to be the only run of the over. Prasad is brought back into the attack and is worked away by both Ballance and Robson for singles. The latter then tries to take another quick run after driving the ball to Herath at mid off but it is an ill-judged run and Ballance would have been gone with a direct hit, which fortunately for England doesn't come. Ballance ends the over with a strange-looking flick pull into the leg side for a single. Herath concedes two singles from his 18th over of the innings but almost has Ballance caught when the left-hander edges to Kaushal Silva at short leg. The fielder had to react quickly but should really have taken the chance. Atherton asks: "England v Yorkshire. If Root, Ballance and Plunkett played for Yorks, who would win?" Herath continues his spell and concedes three runs as Ballance works two through midwicket and then grabs a single, again through midwicket. Sky Bet have priced up the chances of Robson and Ballance making centuries, with Robson currently odds-on at 8/15 to get his with 22 more required while Ballance is 5/6 with 66 runs to his name. Find Sky Bet's full in-play markets here. Ballance swipes Prasad through the off side for a single but that proves to be the only run of the over until Robson fashions another run off the final ball. Anderson fizzes two beauties off a decent length past the bat of Silva but ultimately fails in his attempts to find the edge and the right-hander sees out the over, which had earlier yielded a single from Karunaratne. 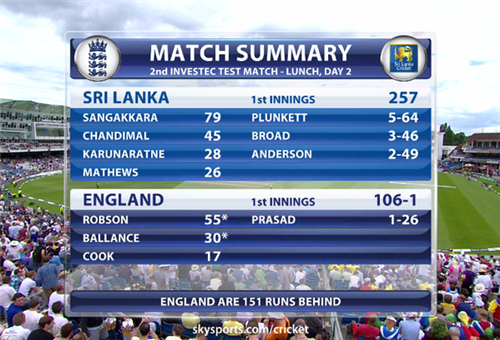 Karunaratne goes back into his shell somewhat as Broad's accurate line produces another maiden over. Silva works Anderson away through midwicket but it is not struck strongly enough to reach the boundary and instead the batsmen run three. Karunaratne continues his subdued play when given the strike back and there are no further runs from the over. [betting]Sri Lanka have come in from as long as 12/1 to 10/3 as they look to reduce England's healthy lead, with another draw deemed unlikely now at 7/1. Karunaratne is considered the most likely to be the first man out for the tourists at 8/11, with Anderson rated the favourite to be the leading wicket taker in the innings at 11/4. Find Sky Bet's in-play odds here. The first change of bowling sees Jordan brought on to replace Broad. He has four slips in and opens up with a maiden over as Silva cannot fashion any scoring opportunities from the bowler's decent line and length.